The Theatre Royal Haymarket Masterclass Trust is a small charity that has a big impact on young people’s lives with a unique offering of masterclasses, apprenticeships, creative opportunities and performance experiences. Masterclass plays host to the biggest names in theatre and the Arts as they come to share their experiences of the industry and their careers in a regular series of inspiring talks and workshops for young people. The programme is free for anyone between the ages of 14–30 and is vital in order to support, nurture, empower and create exceptional opportunities for future generations. The support of Outset Family enabled Theatre Royal Haymarket Masterclass Trust to deliver a series of Peter Pan theatre based workshops for the children and young people who are patients at The Hospital School, Great Ormond Street Hospital (GOSH) and to immerse them in the pre production process of putting on a show. 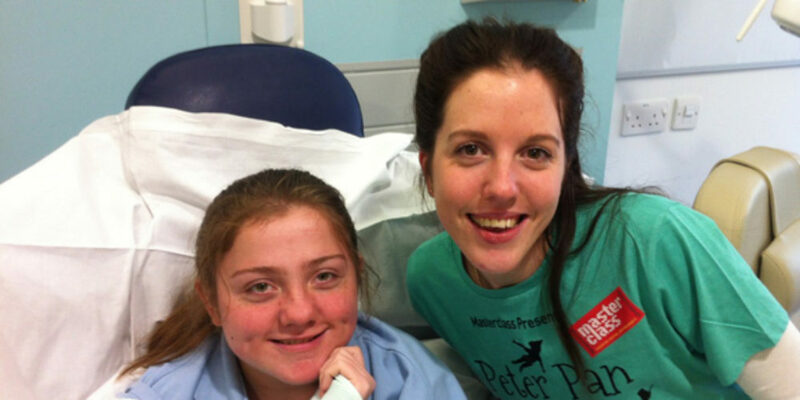 The workshops were based around Peter Pan and held at The Children’s Hospital School over half a term (throughout January and February 2013). The workshops were run by theatre professionals and linked into the School timetable, covering the areas of storytelling, singing, movement, poster design, costume design, acting and play. The objective of the workshops was to create a project that was fun, imaginative and creative, with a focus on increasing confidence, self-esteem and fundamentally the happiness of all children and young people taking part. Whilst giving the children an insight into the theatre making process and resulting in a positive experience for all participants.